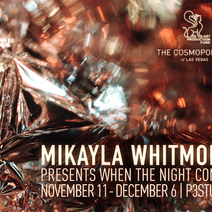 Mikayla Whitmore was born and raised in Las Vegas, Nevada and received her Bachelor of Fine Arts degree from the University of Nevada, Las Vegas in 2010. She has exhibited and curated at multiple venues including the Winchester Cultural Center, Contemporary Arts Center and the Marjorie Barrick Museum. Her work examines the potential of a photographic image by combining multiple photos into a single picture in an attempt to explore the way memory works. In 2012, she explored this concept in her award-winning exhibition titled “Forever No More,” where she paired images with hand-stitched text, receiving a grant for her work. In 2013, she served as a creative director at a one-night event inside the historic Gateway Motel in Las Vegas, where over 600 people came out to see work by 30 artists, community groups, bands, and local businesses. She currently balances her studio practice with her work as a staff photographer for Greenspun Media Group. Additionally, she enjoys researching dinosaur species and planting succulents.